G protein-coupled receptors (GPCRs) comprise the largest family of integral membrane proteins, which are coupled to heterotrimeric G proteins to influence cell signaling. Subsequent to G protein activation, agonist-stimulated G protein-coupled receptor kinase (GRK) phosphorylation results in the recruitment of β-arrestin proteins, which form both stable and unstable complexes with GPCRs. β-Arrestins when bound to GPCRs not only contribute to the uncoupling of G protein signaling but also to the redistribution of GPCRs to clathrin-coated pits via their association with both clathrin and β2-adaptin facilitating GPCR endocytosis. 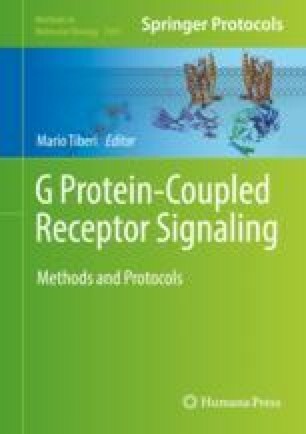 This allows β-arrestins to couple GPCRs to additional cell signaling proteins allowing a second wave of receptor signaling. Importantly, the β-arrestin-regulated subcellular localization of these complexes also plays a critical role in regulating how these signals are transduced and which proteins are recruited. Here, we describe a methodology for assessing the GPCR subcellular localization by super-resolution microscopy and suggest that this methodology can be extended to the study of GPCR/protein complexes.